Online identity is something we’re all beginning to face. We exist in a time when the majority of our digital footprints are being copied somewhere else. One AOL searcher so far, Thelma Arnold of Georgia, 62, has been identified by the NYTimes to be unique user 4417749. This is a disturbing first shot across the bow and we need to take every precaution, both as companies doing business and as consumers using these services, that this information be protected (or never stored at all). Every search is being remembered and potentially could be aggregated later with unknown consequences. Every email we send works via a store-and-forward technology (your email is a postcard much more than a sealed postal service letter). Every hop along the way (average of 10-15? ), the email servers could save your email for later. Subpeanas anyone? To protect the children? It’s not fearmongering, it’s a healthy dose of reality and risk analysis. So first of all, we’re not anonymous. Second of all, this non-anonymity can be assumed by someone else if the procedures and protections we put into place are poorly thought out. 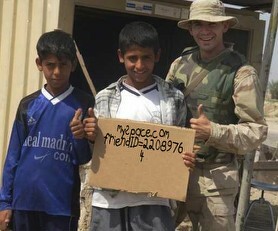 So I find it interesting today this juxtaposition of an Iraqi child holding a piece of cardboard claiming he’s Rupert Murdoch, owner of MySpace, performing the ‘MySpace salute’. Probably, being the actual Rupert, there is little chance Rupert’s real identity will be compromised by this wonderful image. Those of us who are not Rupert, in name or in financial stature, have a significantly greater risk associated with issues concerning our online identity and attempts to hijack it by others. We need to become more aware, vigilant, informed, and proactive about our online identities. Our public face is a growing part of our reputation and is beginning to play a significant role in our day to day lives. There are early adopters who have seen this effect for a few years now, but the mainstream media is now catching on and the average citizen will begin to interact with these issues very directly. We all swipe the grocery store member cards to save 10%. Do we know what can be done with data mining and aggregation over time? ClaimID is using MicroID to allow individual users to claim the pages online about them. This uses cryptographically robust mathematics to confirm that the pages on both ends of the claim are legitimate. It’s proactive, it’s reproducable, and it’s open. It’s not a piece of cardboard. Rupert cannot claim that my weblog is his. Neither can that Iraqi child. We need more awareness so our policies are better. I’m afraid, however, that it requires us to endure a listing of a few million customers like Thelma before the rest of us wake up. Posted by Terrell Russell on Thursday, August 10, 2006, at 11:18 am. Filed under aol, claimID, copa, doj, identity, MicroID, myspace, rupert. Follow any responses to this post with its comments RSS feed. Both comments and trackbacks are currently closed. Awesome, trel. Absolutely awesome. I’m going to claimid right now. « Who’s in my network? Who’s cool enough?